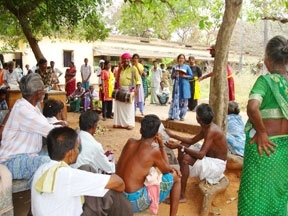 Supported by Tamil Nadu State and AIDS Control Society – Nalamdana’s “Are You Well” Project at Tambaram, focuses on care and support for the patients of the Government Hospital of Thoracic Medicine, which is one of the largest public hospitals in Asia catering to both TB an HIV patients. Under this project, Nalamdana offers brief role plays and longer evening plays on issues relevant to People Living with HIV and AIDS (PLWHA). It has also developed “Thendral”, a state of the art cable radio station offering seven and a half hours of programming daily, six days a week on the entertainment – education platform in Tambaram hospital’s 18 TB and HIV wards and the OP area. Also weekly support group meetings are being conducted regularly for women on every Tuesday and Thursday. Nalamdana encourages and also involves PLWHA to participate in the role plays and radio programs.